One of my good friends and coworkers is getting married in less than a week so we decided to throw her a wedding shower at work and I volunteered to make the cake. 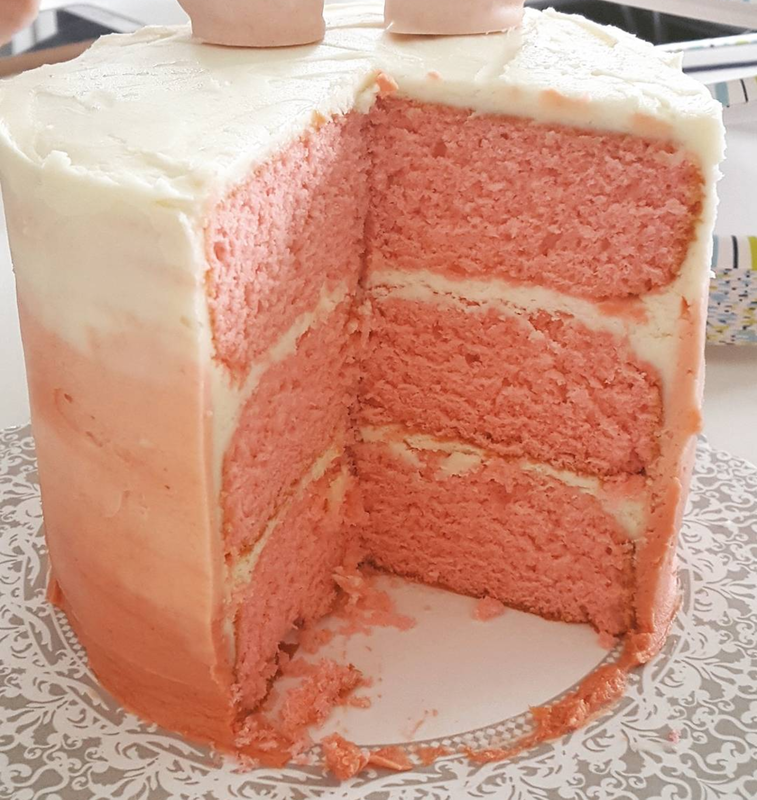 I’ve made a champagne cake before but decided to make it prettier (and girlier) by using pink champagne this time and coloring the cake layers with pink food coloring. I also decided to try my hand at ombre frosting. This was my first attempt at it and I’m actually pretty pleased with how it turned out. I’ll definitely be trying this technique again in the future. 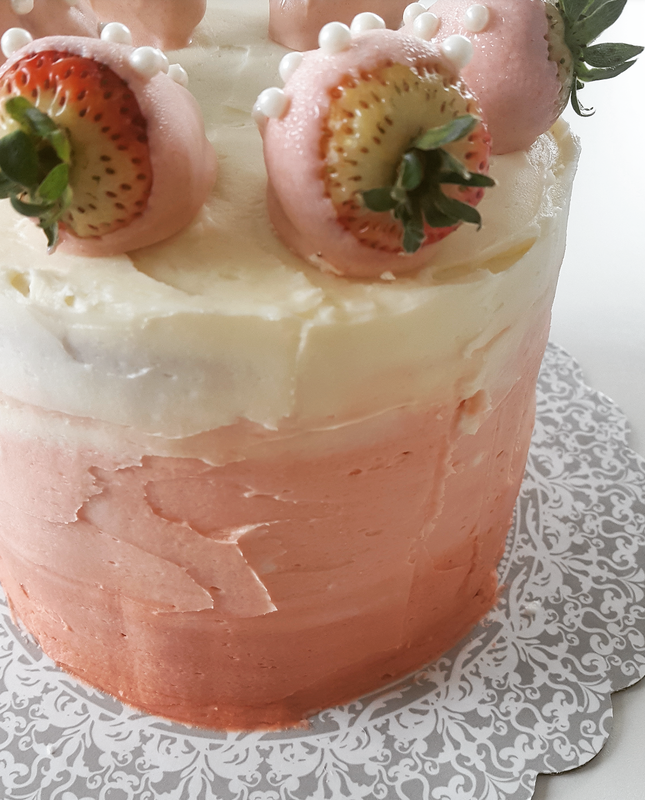 Then, to really amp it up, I dipped strawberries in white chocolate colored pink and sprinkled them with sugar pearls for the top of the cake. All of the girly pink decorations are totally optional, of course, but they do make it fun. However, if you or your guests are really pink-averse, this cake is still a crowd pleaser if you opt for the classic white cake spiked with champagne (or even prosecco!) and do a simple white champagne buttercream frosting. This cake can also be made in two 8-inch cake pans or as cupcakes. Make the cake. Preheat oven to 350 F. Grease three 6-inch round cake pans and line with parchment. Mix together flour, baking powder, and salt in a large bowl. Mix together the pink champagne and vanilla in a measuring cup. In the bowl of a stand mixer, cream together the butter and sugar. Add the flour in three additions, alternating with half of the champagne/vanilla mixture. Stir in food coloring, making the batter slightly darker than desired (the addition of egg whites will dilute the color some). In the clean bowl of a stand mixer, whisk the egg whites on high speed until stiff peaks are formed. Fold the egg whites into the batter and divide between the cake pans. Bake 25-30 minutes. Make the frosting. Beat the butter on medium speed until smooth and fluffy. Stir in vanilla. Add six cups of powdered sugar, one cup at a time. Add the champagne. Add remaining cup of powdered sugar, or as much as you need to reach your desired consistency. Make it pink! Divide the remaining frosting into three bowls. Leave one bowl white, color one bowl light pink, and color the last bowl medium pink. Pipe the frosting on the cake, one color at a time. I started with the medium pink on the base of the cake, then the light pink in the middle, and white at the top. Use the same piping bag and don’t clean it out the tip between colors to help with the transition. Take an offset spatula and smooth the sides and top, cleaning the spatula between strokes to avoid muddying the colors. Make the strawberries. Melt about 1/2 cup white melting chocolate and color it pink. Dip the strawberries, set on wax paper, and sprinkle sugar pearls on top. Arrange on the top of the cake.